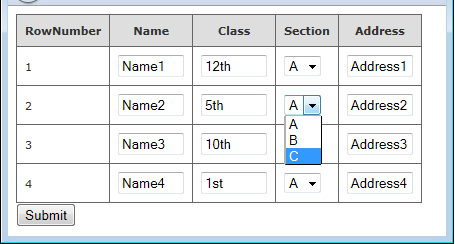 This will show you how you can use a use dropdown list inside an MVC webgrid. This article will explain you how you can Bind DropDownList In MVC WebGrid and Retrive Value Using Asp.net MVC, C#.Net. This article you can use in MVC3,MVC4,MVC5. Some of my previous articles are as follows: Add Textbox In WebGrid and Access TextBox Value In Controller In Asp.net MVC Using C#.Net, FileUpload Control Inside WebGrid To Upload File In Asp.net MVC Using C#.Net, Auto Increment Row Value In Asp.net MVC WebGrid Using C#.Net, Access TextBox and TextboxFor Value From View To Controller In Asp.net MVC, C#.Net, Frozen Rows and Columns in Asp.Net Mvc Webgrid Using jQuery Like Excel Sheet, How to Bind Data to Webgrid in ASP.net MVC Using C#.Net, Display User Detail Using jQuery ToolTip In Asp.Net MVC WebGrid, MVC WebGrid Custom paging With Page no and Shorting Data Using C#.Net. So for this article first we will create a new asp.net mvc application and add a model class files into the module folder. So here is the model class file code. Now again come to your application and add a controller class file into the controller folder. Now use the below code into your controller folder. In above code please check the above code in this code first I will discuss two functions StudentRecord and GetSectionList. 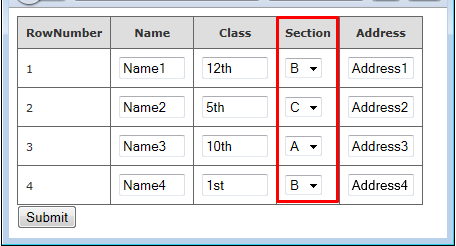 In this first function StudentRecord is used for getting the record for binding the webgrid, and GetSectionList is used for assigning the dropdown list data. Now please check the Inex action result for populating data on page load and httppost methos to get the selected value of dropdown list on postback. In httppostwe have retrieved the value selected in dropdownlist and then we have assign the selected value to the select list. This we are doing because when post back take place we want to retain the selected value of dropdown list inside the webgrid. Now we will create the view of index actionresult. Add the below code into your view. In above code we have created dynamic name of each control present inside the webgrid. We are creating dynamic name because when postback take place at that time we will be able to access the added and selected value inside the webgrid. Please check the below view code. This code is used for binding the dropdown. Now run the application and check the view source of the page you will get the control name in array form. This array name is responsible for accessing the value. Now we have done just run the application to check the output. Now select the value and click on submit button your brake point and here you see we are getting the selected value which we have selected in dropdown which is present inside the webgrid. Hi this article is regarding "Bind DropDownList In MVC WebGrid and Retrive Value Using Asp.net MVC, C#.Net". This code works properly. There is no error. What you trying to do. how can i fetch data from database in dyanamic gridview textboxes??? What change should I make to the View, so that I have a label for "Name" instead of a Textbox. Hi in this example can we make dropdown enable when we click on edit button ? You just need to call a js function on click of button ,which enable the ddl.